The Ebricks.com Window Shades guide offers information about companies such as Shutter Shack and Theodore Ellison Designs. Located in northern Vermont, this company has focused on energy efficient window treatments since its founding two decades ago. Today the company sells window quilts and shades factory-direct. 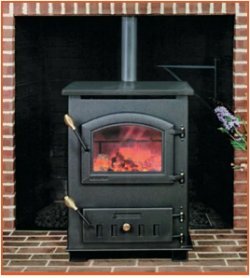 Made in the USA, a coal stove that will burn for days without refueling and without electricity. 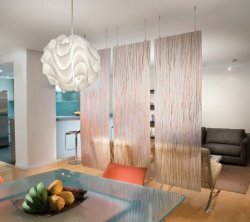 Free-hanging decorative panels help define spaces within rooms.